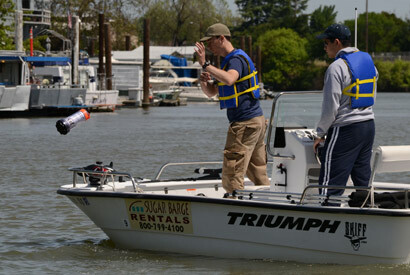 Graduate student, Andrew Tinka, demonstrates the Floating Sensor Network water monitoring project in Walnut Grove, CA. Video by Roxanne Makasdjian. 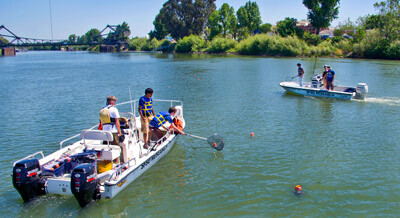 A fleet of 100 floating robots took a trip down the Sacramento River today (Wednesday, May 9) in a field test organized by engineers at the University of California, Berkeley. The smartphone-equipped floating robots demonstrated the next generation of water monitoring technology, promising to transform the way government agencies monitor one of the state’s most precious resources. The Floating Sensor Network project, led by associate professor Alexandre Bayen, a researcher at the Center for Information Technology Research in the Interest of Society (CITRIS), offers a network of mobile sensors that can be deployed rapidly to provide real-time, high-resolution data in hard-to-map waterways. One area that stands to benefit from this technology is the Sacramento-San Joaquin River Delta, with its complex network of channels that direct drinking water to two-thirds of California’s population and irrigation water for 3 million acres of agriculture. Having a high volume of sensors moving through the water can shed light on processes that are influenced by how water moves, such as the spread of pollutants, the migration of salmon or how salt and fresh water mix in the Delta’s ecosystem, the researchers said. Today’s field test gave researchers a picture of how water moves through a junction in the river with a resolution never before achieved. Such a flexible system could be critical in the event of an emergency, including a levee breach or oil spill, the researchers noted. The sensors could be thrown into action from a dock, shore, boats or even helicopters. The May 9 launch in Walnut Grove, Calif., marked a milestone in the project, which is supported by CITRIS and the Lawrence Berkeley National Laboratory (Berkeley Lab). It was the first time researchers deployed their full arsenal of floats, each equipped with GPS-enabled mobile phones encased in 12-inch-long watertight capsules marked with fluorescent tape. The researchers wrote specific programs to run on the open source platforms used in the robots and on the smartphones. The project is an evolution of earlier research led by Bayen called Mobile Century and Mobile Millennium, which uses GPS-enabled smartphones to monitor traffic flow. Instead of a map of traffic, the Floating Century mobile probes created a map of water flow. Every few seconds, the phones in the floats transmitted location data back to servers at Berkeley Lab’s National Energy Research Scientific Computing Center (NERSC), where the data was assimilated using a computer model called REALM (River, Estuary and Land Model). Information was processed to create a map that allowed researchers to track the devices on their computer monitors. The REALM model was developed by researchers at the Berkeley Lab and the California Department of Water Resources. It was later expanded to integrate data from mobile robots by Qingfang Wu, a UC Berkeley graduate student in civil and environmental engineering. Although the sensors in the test were set up to monitor the speed of water currents, the researchers said the floats could be equipped with sensors for a variety of measurements, including temperature, salinity, or a contaminant of interest. Of the 100 floats in the fleet, 40 were autonomous devices fitted with propellers to help them move around obstacles or targeted areas. The Floating Sensor Network’s fleet of robots includes prototypes with advanced capabilities, including models that can dive below the surface of the water, versions equipped with salinity sensors to measure the water quality in rivers, and versions with depth sensors that can map out the shape of the channels in which they float. The floating sensor network has been tested in collaboration with the U.S. Department of Homeland Security and the U.S. Army Corps of Engineers to assess water discharge downstream from broken levees. The researchers are also planning a deployment to monitor the ecosystem of Lake Tahoe in the coming months. Floats are retrieved at the end of experiments, but the researchers acknowledged the possibility that devices can get lost. The researchers said they expect the expense of individual sensors to go down with continuing advances in mobile communications so that the system can better tolerate a certain level of device dropout.